Well exactly two weeks ago the fate of most British Spartathletes had mostly been decided. Pat Robbins had run all of the 153 miles to Sparta in an incredible debut run, finishing in just over 27 hours. Robbie Britton was not far off kissing the foot he’d been dreaming of for some time. All of the unsuccessful runners were at the side of the road in Sparta to cheer the remaining runners home. Steve Scott and Jonny Hall looked like they were having a glorious time out there and finished really strong. James Elson finished what he started a year ago and completing the race that had been on his mind for some time. Mark Woolley has become the expert in this race, finishing for the third successive time and making his Spartathlon score 3-2 in his favour. Paul Ali on his first attempt did exactly what he set out to do in his typical well organised style. It was 7 out of 20 for the Brits this time. I think we’d all agree everyone had an interesting experience out there even if for 13 runners it did not go as well as expected. 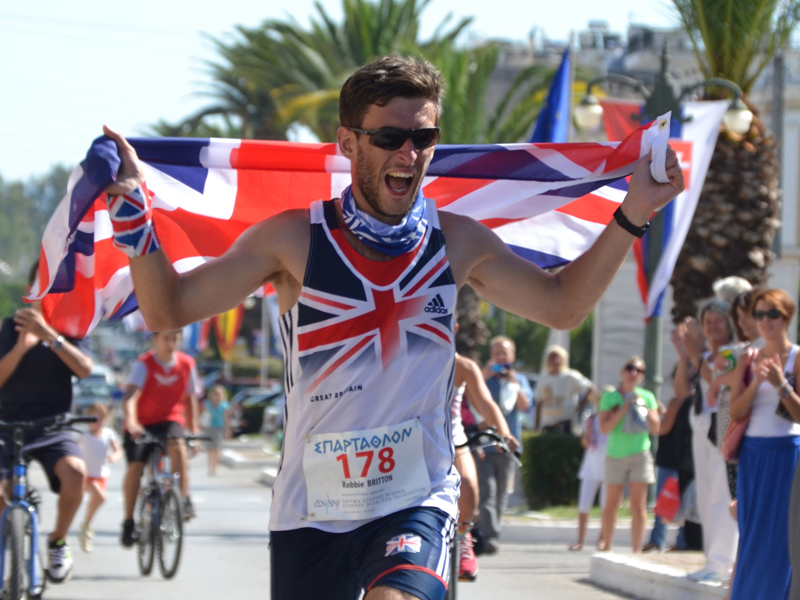 The British Team looked fantastic out there and for that we are grateful to our wonderful sponsors, Buff and The ULTRAmarathonRunningStore for providing us with Buffs and T Shirts which looked incredible and were the envy of many nations. A big thanks to Mark Howlett Design for this wonderful logo that you see. Below are a collection of the blogs that have been collected so far. Robbie Britton overcame sickness to battle through and still finish in a really quick time. In interview with Jonny Hall is here. James Elson descibes the journey from last year and what it meant to finish it this time. Mark Woolley finishes for the third time and has some great advice for others wanting to complete this event. Paul Ali had never DNFed a race and this race would have been a big threat to that record. However Paul does what Paul does and finishes it well. Of those who didn’t make it, here are the stories written so far. Mimi Anderson took her body as far as it would go on this occasion, it was desperately close to the end. Read this report about what it is like to push yourself to the limit. Alternatively read the opposite, the story of James Adams who just quit. A story which has tried to be as honest as possible about what he believes is the reason behind most DNFs in Ultras. Rob Pinnington was the British Team’s most improved player. He got much further this year than last and with similar effort this year he will make it to the finish next time. Here is a great report from Mike Blaimes. Let the journey to Sparta 2014 begin..